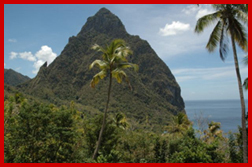 There was no reason to leave the luxurious confines of Coconut Bay Resort & Spa on the southern tip of St. Lucia near the small port city of Vieux Fort. My children had everything they could want. Pristine white beaches with a nearby reef for snorkeling. A water park whose varieties of slides -- from long winding curlicues to fast and furious chutes -- could keep both the adventuresome and the more timid amused for hours. And then, of course, the pools - big expanses of clear, cool water surrounded by umbrellas and beach chairs. It was enough to make us all as lazy as the appropriately named lazy river, on which we floated through the water park. When we wanted to retreat from the sun, we just sat in the oversized chairs in the vast lobby which opened on to the beach. And then there was the food. Since our family of four all have different tastes, it was nice that there was so much to choose from -Italian at the Bellagio, Asian at Silk, a beach grill that was open 24 hours with fresh tuna, hamburgers, French fries and even grilled vegetable sandwiches, as well as the Coconut Walk, which featured both island foods (since St. Lucia has exchanged hands between the French and the English seven times, local food is a combination of French Creole, British and also what is available locally such as plantains, mangoes and, of course, very fresh seafood). So why even think of making our way out of the stately palm tree studded 85 lush acres with its beach front rooms that comprise this family owned and family oriented resort? To start with, there was the list. Provided by the resort when we checked in (along with a very tasty rum punch which is served to guests after they've made the short ride from the airport to the resort), the list was long and told us about all the adventures that awaited us on the island. It didn't matter that we all wanted something different as there was something for all of us - my husband, my self, our 18-year-old son and our 12-year-old daughter. St. Lucia, which is tucked way down in the Caribbean in the West Indies, is lush and verdant, its pitons (molten rock pushed upright through the earth's surface), tropical rainforests, volcano, beach villages, hidden coves, fern covered mountain trails, waterfalls and plantations teeming with banana trees and colorful and perfumed flowers including masses of bougainvilleas that seem to drip down every wall and hillside. There were also tours of the jungle tops along zip lines and even mountain biking. Unsure of what to do, we decided to try to jam as much into one day figuring that it would give us a glimpse of the best the island had to offer. 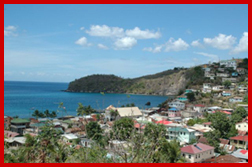 We chose to travel west from the resort through Vieux Fort and up the mountain passes leading to our first stop, the small village of Choiseul, which is known for its crafts. Stocking up on bracelets made from the local volcanic rock polished to a glossy ebony and also on the local sauces (I chose ginger, banana ketchup, garlic and green) produced by a company called Baron in Vieux Fort, we continued on past the two majestic twin volcanic peaks called Les Pitons, stopping to shoot photos in what is probably the most photographed spot of the island. After more photographs it was on to Sulphur Springs, an active (but no eruptions for more than two centuries) volcano on the west coast of the island. Billed as the world's only drive-in volcano, the seven acre Sulphur Springs, surrounded by tree topped pitons and with views of the ocean in the distance, looks in some parts like a mysterious moon walk with its bubbling pools of sulphur water (and yes, there is a strong spoiled egg smell). The French owned the island during the rule of King Louis XIV and he very much wanted his men stationed here to stay healthy and thus established elaborate bath houses on the grounds in 1713. Some of those remnants can be seen at the nearby Diamond Botanic Gardens Waterfall and Mineral Baths where people still do bath in the warm, sulphuric waters which are said to medicinal. We didn't stop for a bath but instead followed the coastal road towards Soufriere. So far we had a day of beauty - driving along the island's roads, but none of use were prepared for what lay beyond one of the hairpin turns as we neared this 250 year old village that was once the capitol of St. Lucia. Below us, was a small bay whose aquamarine shoreline was filled with brightly colored wood fishing boats and whose buildings, done in the Caribbean style of pastel colors and Creole gingerbread framework, was Soufriere, as picture perfect of a town as can be imagined. We drove down the twisting road towards the town square dominated by a flower garden surrounding a centuries old Catholic church. One of the main crops of St. Lucia, besides bananas, are cassavas, a dense starchy vegetable that can be fried, boiled, or, as we found out when we stopped at a road side stand, mashed into thick round circles and flavored with bananas, strawberries, cinnamon, raisins or papaya creating a dish with the consistency and taste of a fruit cake all for $2 EC or about 75 cents American (note money is interchangeable here). Munching on these we traveled further along the western edge of St. Lucia, passing through several other picturesque fishing villages and then finally ending up in Marigot Bay where, at J.J.'s, we ate such island dishes as seafood roti (a thin pastry stuffed with tiny local shrimp, octopus and mussels) and a savory chicken stew served with rice and bananas. Our last stop of what was a long, but eventful day was Castries, the island's capitol, a bustling city located on the Atlantic Ocean. Here there was enough shopping to keep even my shopaholic daughter happy. First we stopped at the Castries Market where we stocked up on more island jewelry, baskets, as well as colorful batik dresses and linens and then on to the duty free shops where, after showing our passports and plane tickets, we could buy rum and perfumes at exceptionally low costs. We had enough energy for one other stop and so visited Eudovic's Studio on the Morne, where we watched wood workers carve statues and bowls out of teak, purchased a couple of objects for home and then crowded back into the white van ready to return to the resort. This one day tour had given us plenty of ideas for what we wanted to do next - me to visit some of the plantations that date back to the 1800s and are now open for tours; my husband and son to climb Gros Piton (with a guide, of course) which is 2,554 feet and my daughter to take a boat from J.J.'s in Marigot Bay to the small sandy beach that we could see from the deck of the restaurant as we ate. It is a short ride and only costs 50 cents but takes you to yet another magical place on St. Lucia. Back at Coconut Bay, we have time for a quick swim before we get in line for the Island buffet set up on the expansive lawn. Soft music from a local band plays in the background and the soft breezes stir the fronds of the palm and ginger trees. Just another night in paradise. For a family sharing one room - a 4-night package is $900 (normally $1640) and an 8-night package is $1800 (normally $3280). For a family opting to have one room for the parents with a second connecting room for the children - a 4-night package is $1350 (normally $2400) and an 8-night package is $2700 (normally $4800). OR view our Coconut Bay Resort review for families here. More on other family destinations here.